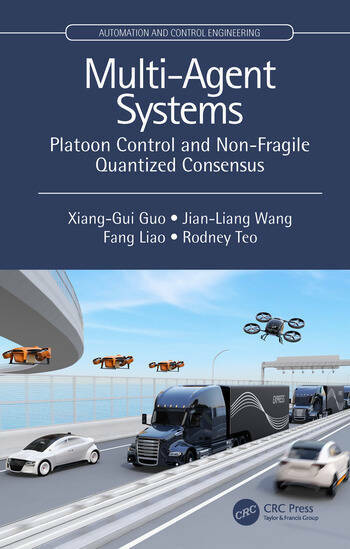 Multi-Agent Systems: Platoon Control and Non-Fragile Quantized Consensus aims to present recent research results in designing platoon control and non-fragile quantized consensus for multi-agent systems. The main feature of this book is that distributed adaptive sliding mode control (SMC) algorithms are proposed to guarantee strong string stability based on modified constant time headway (MCTH) policy. The MCTH policy is used to remove the unrealistic assumption in the most existing literature that initial spacing, velocity and acceleration errors are zero. This monograph investigates the platoon control issue by combining SMC technique with neural network and fuzzy logic system approximation methods. Xiang-Gui Guo is an Associate Professor with the School of Automation and Electrical Engineering, University of Science and Technology Beijing, Beijing, China. Jian-Liang Wang is an Associate Professor with the School of Electrical and Electronic Engineering at Nanyang Technological University, Singapore. Fang Liao is a Research Scientist with Temasek Laboratories, National University of Singapore, Singapore. Rodney Swee Huat Teo is a Principal Member of Technical Staff of the DSO National Laboratories, Singapore, and a Senior Research Scientist with Temasek Laboratories, National University of Singapore.